Simulations serve as a bridge between microscopic and macroscopic theory and experiment. Class of computation algorithms that rely on repeated random sampling to compute their results. Generates states according to Boltzmann probabilities. Useful for situations dealing with Boltzmann distributions. Uses numerical methods and approximations of known physics to determine the interactions of an array of molecules. Gives a route to dynamical properties of the system through equations from Newton, Hamilton, Lagrange et al. Atomic forces are determined through the potential energy between the two atoms. The force terms are derivatives of energy expressions (Lagrangian function) in which the energy of atom is typically written as a function of its position with respect other atoms. Potential energy between each molecule must be calculated. To reproduce properties of interest as closely as possible. Can be used to study a variety of properties for which it was not fit. Calculations are fast with simple potentials. Solve the system of equations for the motion of each atom due to intermolecular forces. It has a local truncation error that varies as (t4) and hence is third order. The acceleration is obtained from the intermolecular potential and Newton’s second law. Prediction of atom positions and their time derivatives. Correction of atom positions and their time derivatives using the discrepancy between the predicted acceleration and that given by the evaluated force (2nd. Newton’s Law). Boundary conditions are satisfied through forcing constraint satisfaction at the end of each time step through SHAKE and RATTLE. MD evolves a finite-sized molecular configuration forward in time, in a step-by-step fashion. Simulation runs are usually short, typically 103 – 106 MD steps corresponding to a few nanoseconds of real time. Simulation run length t must be large compared with ta, or the correlation time. Correlation time may be described as the time to decay from initial value to long-time limiting value. A free boundary condition can be also applied for fast processes when the effects of boundaries are not important due to the short time – scale of the process. 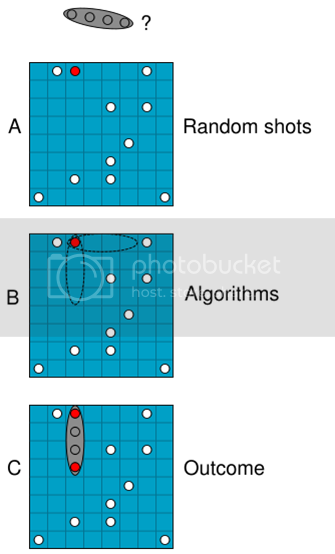 Each computational cell must be larger than 2 rc (minimum image criterion). Silcon transistors are expected to reach a gate length of 28 nm by 2009. Similar to the two-body pair potential from earlier, but is dependent on distance between an atom and the plane parallel to the nearest surface of the film instead of the interatomic distance. Used PSC (Pittsburgh super-computing center) to reduce processing time. Each processor handles the force calculations for the communication cell assigned to it. As seen in previous figures, atoms in one communication cell may exert influence on atoms in a different communication cell. Therefore, the processors must pause and pass messages to each other before each force calculation. 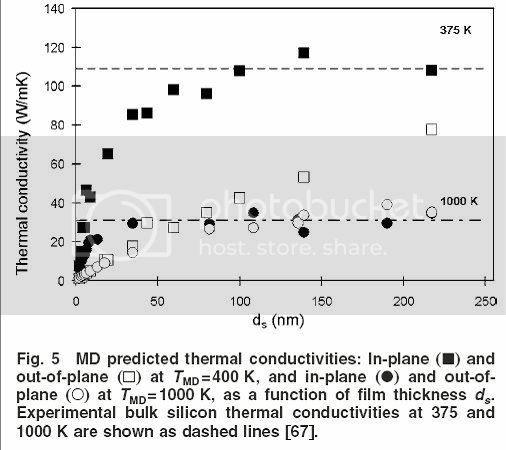 Found that thermal conductivity is reduced with film thickness, is proportional to the effective mean free path. Results are in agreement with kinetic theory and the equation for phonon radiative transfer. Provides researchers access to several of the most powerful computing systems available for unclassified research. Michael P. Allen, Glenn T. Evans, Daan Frenkel, and Bela Mulder. "Hard convex body fluids." Adv. Chem. Phys., 86:1.166, 1993. Carlos J. Gomes, Marcela Madrid, Javier Goicochea, Christina H. Amon. “In-Plane and Out-Of-Plane Termal Conductivity of Silicon Thin Films Predicted by Molecular Dynamics.” ASME Journal of Heat Transfer, Vol 128, pp 1114-1121, 2006. G. C. Maitland, M. Rigby, E. B. Smith, and W. A. Wakeham. Intermolecular forces: their origin and determination. Clarendon Press, Oxford, 1981. A. J. Stone. The Theory of Intermolecular Forces. Clarendon Press, Oxford, 1996. L. Verlet. “Computer Experiments on Classical Fluids - Thermodynamical Properties of Lennard-Jones molecules.” Phys. Rev., 159:98.103, 1967. L. Verlet. “Computer Experiments on Classical Fluids- Equilibirum Correlation Functions.” Phys. Rev., 165:1.201, 1968.